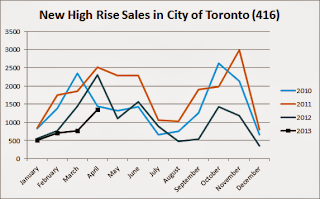 New condo sales in the City of Toronto have crashed by -42% since last April. 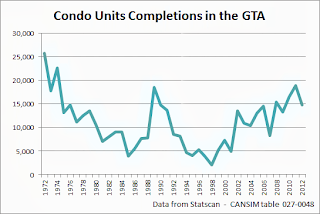 At the same time, the number of condo apartment units under construction in the GTA went up by 17% from a year earlier to 51,448. 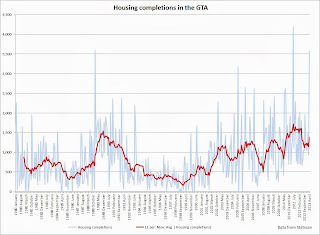 Housing starts were down by -81% in April 2013 compared to a year earlier, while apartment completions were up by staggering 419%. 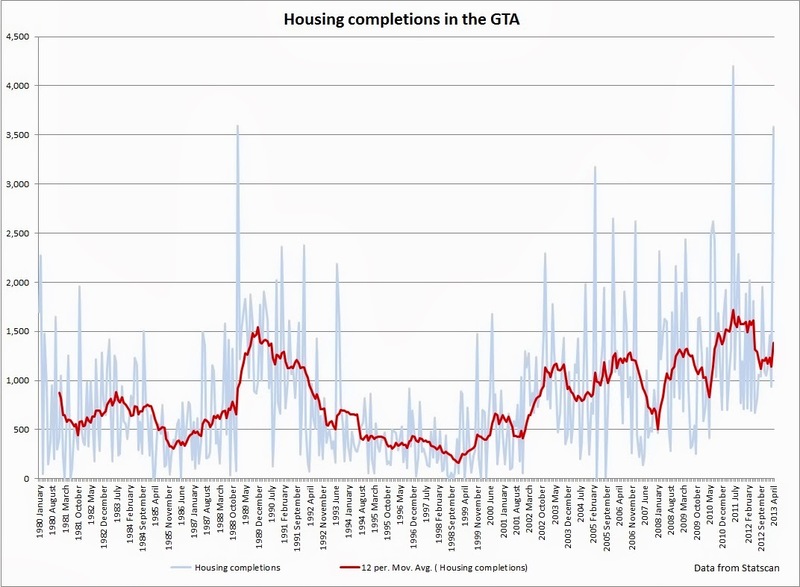 There were 3589 apartment units completed in the GTA last April, the third highest number in over 30 years. 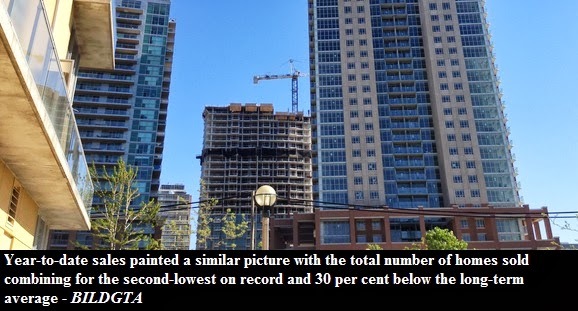 Source: Statscan. 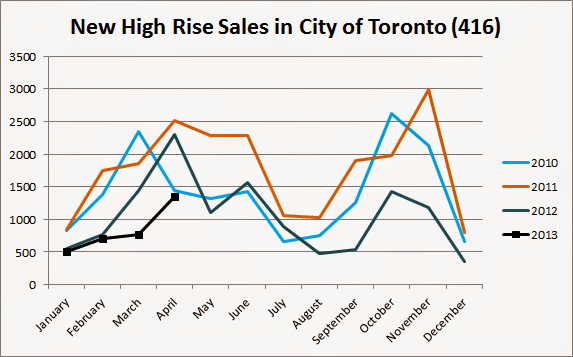 Overall, year-to-date new home sales are 30% below the long term average. The inventory of high rise units is at 22,354. 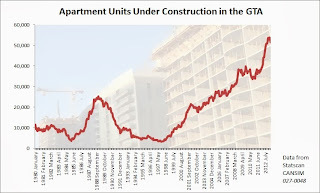 In about April of 2011, the inventory stood at 13,694. 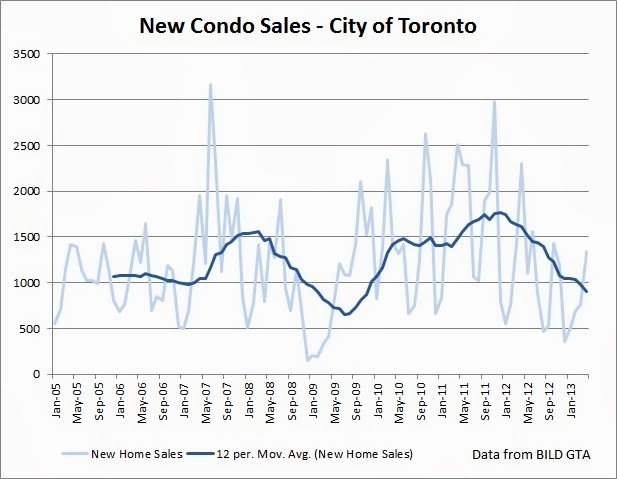 Over 70% of new condos that were sold in April of 2013 were located in the City of Toronto. 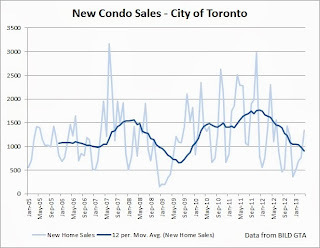 The above graph makes me wonder whether the moving average will surpass the bottom achieved in 2009. 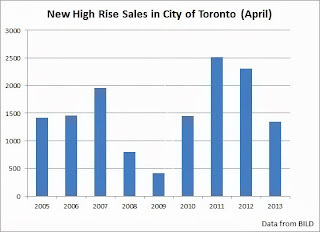 New high rise sales in the City of Toronto between 2010 and 2013 above and between 2007 and 2013 below. 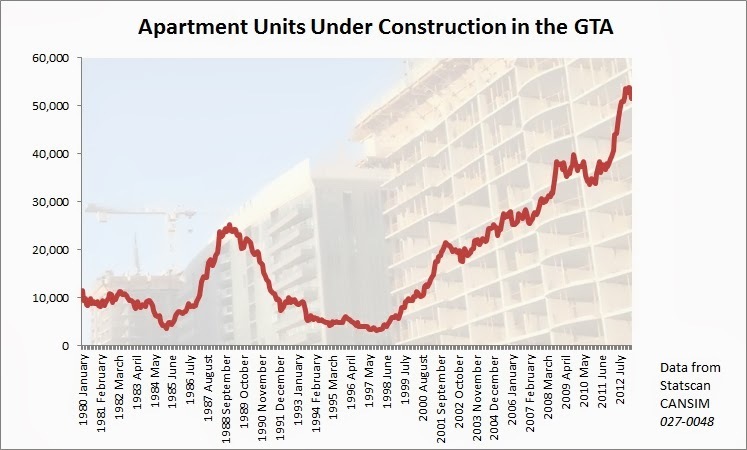 It looks like the number of apartment units under construction in the GTA has reached its peak. The two graphs above are based on the monthly seasonally un-adjusted data and the one below is based on quarterly data which is seasonally adjusted. 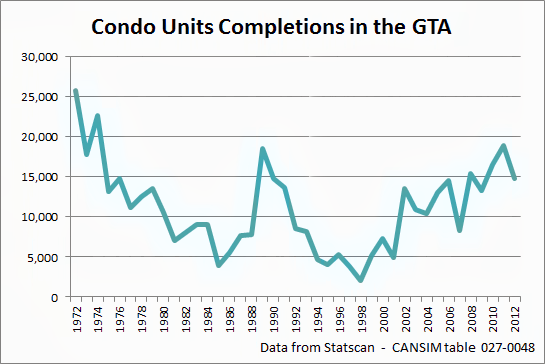 And below is one more graph of condo completions in the GTA, but this time with annual intervals. 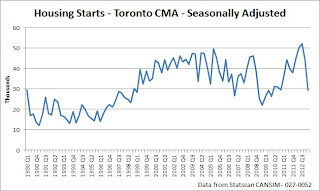 Recently, the Mortgage Brokers Association stated that they expect housing starts in the Toronto area to fall by 50%, to about 22,000 per year by mid-2015. 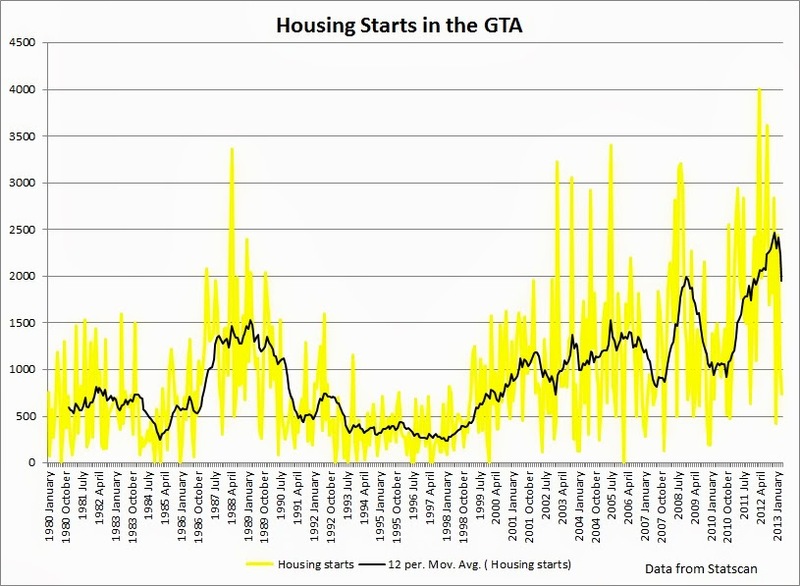 Thing is, Toronto housing starts are already down by over 40% in the last six months. 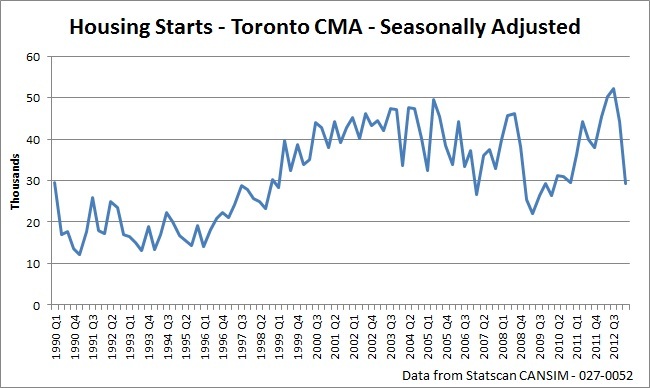 On a seasonally adjusted basis, there were 29,302 starts during the first quarter of 2013 compared to 52,166 starts during third quarter of 2012. 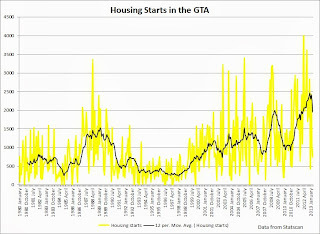 With sales continuing to fall it is hard to imagine housing starts recovering. 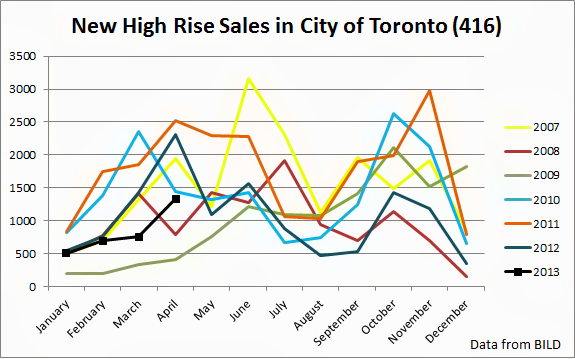 As I've said before, housing starts and new home sales are some of the best indicators for the future of the economy. 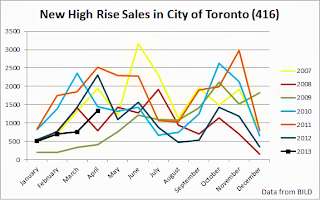 See Also: Is Canada heading for a recession in 2013?